Saint Patrick's Day is just around the corner and I never decorate for this holiday. This year is different. I had a quick and easy, artsy idea AND my husband surprised me with a new camera lens today in celebration of Ashbee Design crossing 2000 views in one day (Yup - record day yesterday - 2027 to be exact. Thanks everyone!) I needed to experiment with this new toy. David has been guiding me and encouraging me in my growing camera skills but adding a new tool of this magnitude is going to take some serious exploration. Now onto my project plan. First of all, "decorate" isn't the proper term. For most holidays (with the exception of Christmas) all that changes is the centerpiece on the dining room table. Once in a while I might do a front door change as well but I keep the holidays relatively simple. I also prefer artsy ideas to cutesy as I have mentioned before. Having just finished my vintage book page flower centerpiece, (which has center stage on my table), I didn't really want to change it. (I have to say that design is one of my all time favorites and I may keep it there for months.) 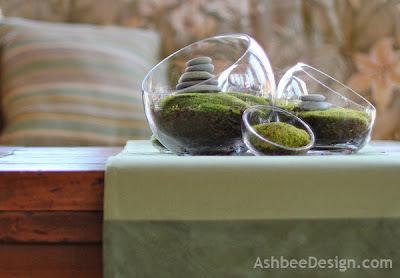 Instead I decided to create a centerpiece for the old trunk that we use as a coffee table in the sunroom. We are having a spell of phenomenal weather and we spend a lot of time in the sunroom. And so I made it today! I love the texture and color of moss and what better thing to use for St. Patrick's Day than something that is gloriously green? 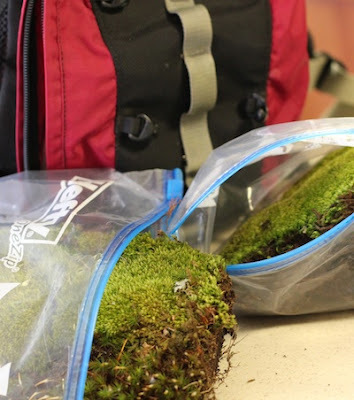 David and I went for our daily 3 mile walk after lunch and as we meandering along the swamp, I harvested some thick green moss. It took a little more effort than I expected. 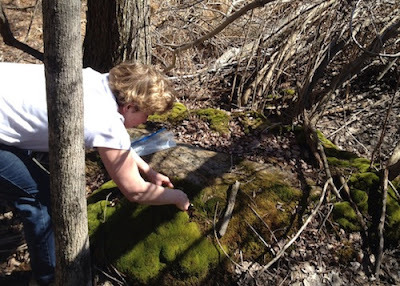 I needed to use David's jack knife and clippers would have worked better on some of the roots intertwined with the moss. But I packaged 4 hunks of the stuff in ziplock bags and lugged it home. 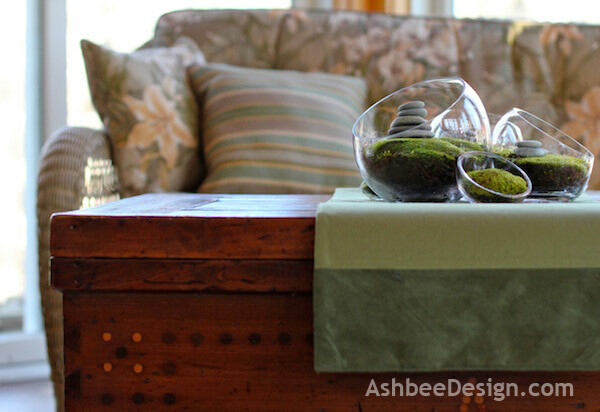 Last Christmas my daughter and son-in-law gave me a set of 6 angle cut Crate & Barrel bowls. The moss was destined for these. 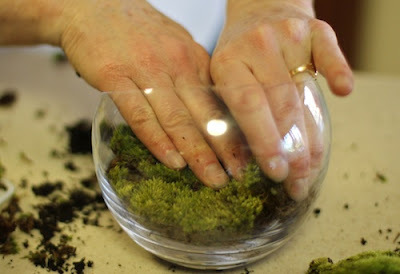 I pressed it over the moss as a guide, and using an old kitchen knife, I cut through the moss in the shape of the bowl. Trying to keep it as one piece, I maneuvered it into the bowl and pressed it in place. My goal was to create a smooth mound of moss. The set of bowls has 1 large bowl, 2 medium and 3 small. 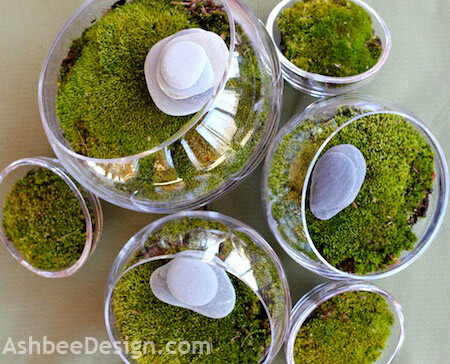 I filled each with moss. For the smaller bowls I had to cut the thick root mat thinner. 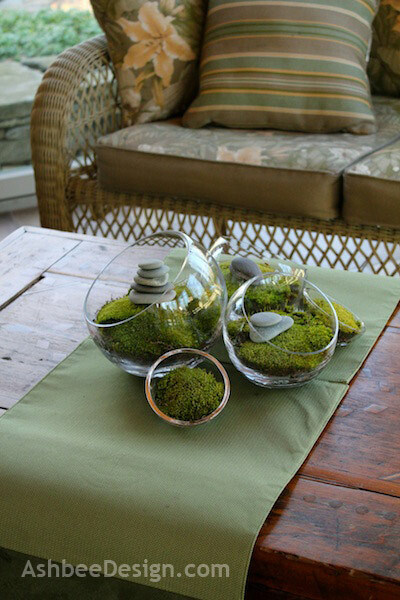 I then brought them out to the sunroom, added moss green placements and a few stacked rocks and a new centerpiece was done. I then spent hours photographing it as I tried out the new lens (50 mm 1.4 lens). It has a very large f-stop which allows for more blurring due to depth of field and a better bokeh. Here are a few of the photos. No pot of gold or leprechaun but lots of green! Thanks to all of you for continuing to visit. I love sharing, and spend way too many hours looking at your sites and pinning as well. Please share your comments, choose to follow and visit often! Tatertots & Jello • Featured Project! Very Cool! 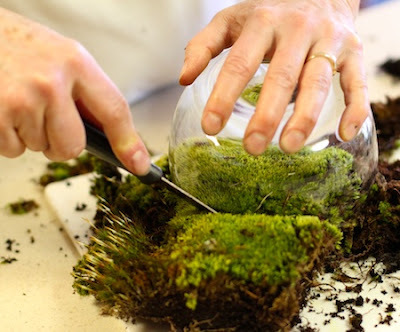 I love terrariums and have many started for spring! This project is so simple and elegant. I love it! 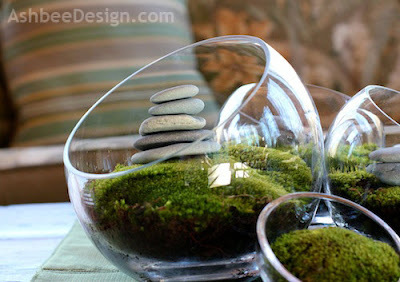 Moss = spring to me and this is perfect for the season. 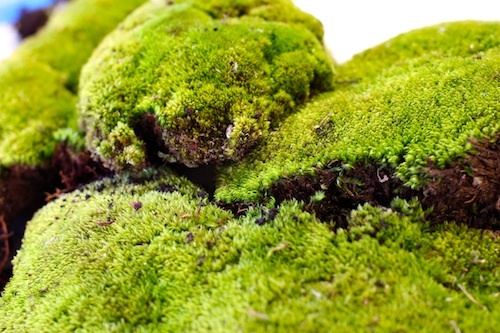 I have moss in my yard. Now I'm going to put it to good use! Love this! The stacked rocks remind me of the hike we took on our honeymoon in Kauai. The first stop point had at least 100 stacks of rocks... it was beautiful. Thanks everyone for the great comments. I have a love for stacks of rocks, have many of them in the garden and create them in the woods as I hike. Bringing them indoors is just a natural. Lovely. I love the mellow, natural look. Great job. How long will it last and how do you care for it? I love the simplicity and it is so vibrant! Thanks so much for sharing with us! We hope that you will join us next week!